As the author of POP! Create the Perfect Pitch, Title and Tagline for Anything (Perigee – Penguin, ’09) (which Seth Godin calls “Revolutionary” and Ken Blanchard says is a “lively guide to getting heard, getting results”), I’m often asked to coach start-ups who will be requesting venture capital. I had the pleasure of delivering the luncheon keynote for the Ignite Clean Energy Summit in Boston for the MIT Center for Enterprise. Following my presentation, I conducted on-the-spot coaching of the national semi-finalists who were all developing “green” businesses. Based on feedback from the group, the following POP! Your Pitch tips were particularly helpful in helping them create winning pitches they presented to potential investors the following day. These tips work whether you’re delivering a pitch, making a sales presentation or speaking at a conference. Review this POP! Your Pitch checklist before every presentation you give so you capture and keep the favorable interest of listeners and command the respect you want, need and deserve. Say something in the first 30 seconds that gets peoples’ eyebrows up. A series of “Did you know?” questions that introduce startling statistics or surprising news is a great way to cause people to look up from their Blackberries and decide you’re worth listening to. POP! Your Pitch Tip #2. 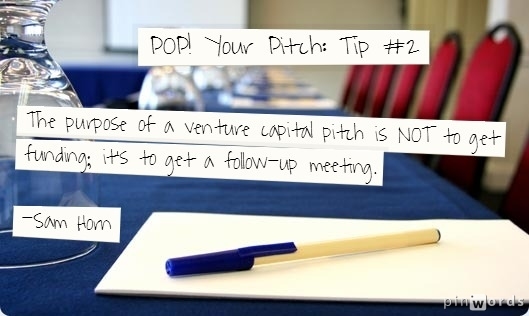 The purpose of a venture capital pitch is NOT to get funding; it’s to get a follow-up meeting. It’s idealistic to think an investor is going to give you millions after a 10 minute pitch. It’s realistic to sufficiently intrigue and impress an investor in 10 minutes so they’re compelled to find out more. POP! Your Pitch Tip #3. Turn audience members into word-of-mouth advertisers by crafting a rhythmic catchphrase people can repeat, word for word. The best way to craft an AIR-tight sound bite is to use Alliteration, Iambic Meter and Rhyme. For example, “Click it or ticket” is better than “Buckle Up for Safety.” I helped an Ignite Clean Energy team come up with “Any plug, anytime, anywhere” as a tagline for their electric car. POP! Your Pitch Tip #4. Insert a one-minute story about how clients have benefited from your company so decision-makers have context (not just content) and connect with you on an emotional and logical level. As the Official Pitch Coach for Springboard Enterprises (which has helped women entrepreneurs receive $4 billion (yes, that’s a “b”) in venture capital, I helped Lauren Williams of Movie Hatch craft a success story about a client who went from having his film collecting dust on a closet shelf to winning the Jackson Hole film festival in less than 4 months. Her 60 second story captured the interest of everyone in the room. POP! Your Pitch Tip #5. Your confidence is indicated by the authority and volume of your voice. If people can’t hear you, they conclude you don’t have the confidence or clout to carry off your venture. I once saw a woman who ran a Fortune 100 company lose a corporate audience at a national convention in the first 2 minutes because she had a little-girl voice that ended with upward inflection that made her seem tentative. POP! Your Pitch Tip #6. POP! Your Pitch Tip #7. PROPS! When you hold up a sample of your product, people SEE what you’re SAYING. Show and tell is infinitely more intriguing than tell, tell, tell. I coached an entrepreneur who is developing a “green, biodegradable needle” to start off her pitch by saying, “Did you know 1.8 billion injections are given every year worldwide? Did you know more than half of them are unsafe? They spread the very diseases they’re trying to prevent because they use used needles.” She held up a baggie with a “used needle” and then contrasted it with her 100% safe, one-use needle. The visual proof was powerful. POP! Your Pitch Tip #8. Tower, don’t cower. The perception of your leadership is measured by your posture. A fig-leaf position means you have something to hide. Hunched shoulders and a tucked-down head are signs of insecurity. Adopt an athletic stance (feet apart, not together), roll your shoulders back, hold your head up and make steady eye contact with everyone in the room at least once to project confidence and command respect. POP! Your Pitch Tip #9. The two most powerful words in a pitch? “For example.” Back up each claim with a real-life example with quantifiable metrics and measurable evidence (i.e., 30% increase in sales, 20% reduction in turnover, took company public with a $10 million profit, grew an organization to 300 employees) so investors know you’ve delivered bottom-line results before and can be trusted to do so again. POP! Your Pitch Tip #10. Provide a useful information very usefulThank you very much. смотреть дополнительные сообщения, как это.